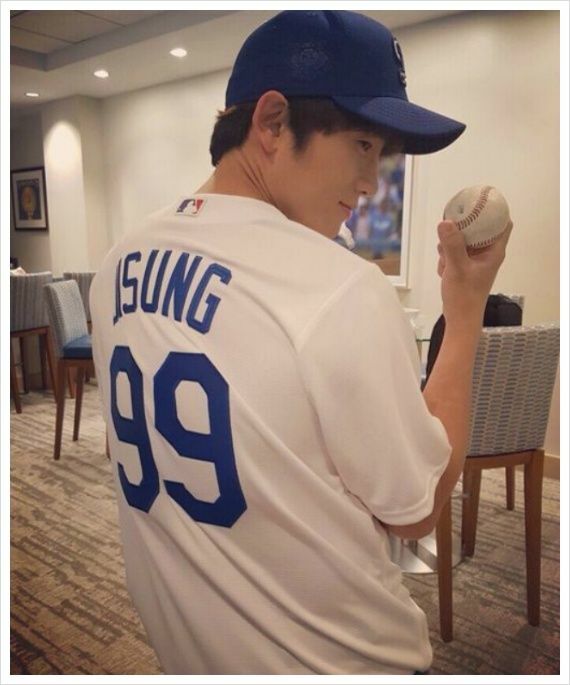 K-actor Ji Sung wears multiple hats from star to husband to father, and on July 6th in Los Angeles he added Korean culture representative to the mix. 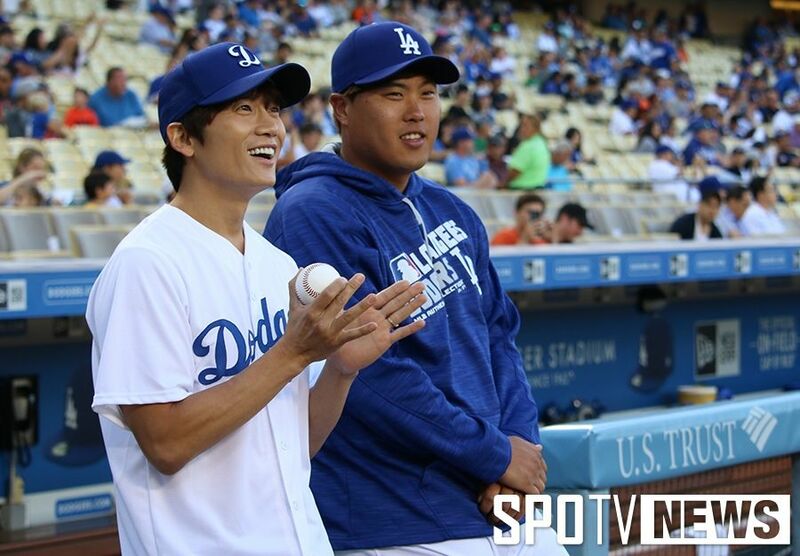 Ji Sung was at the Dodgers versus Orioles game in LA for the home team’s Korea Night at Dodger’s Stadium. 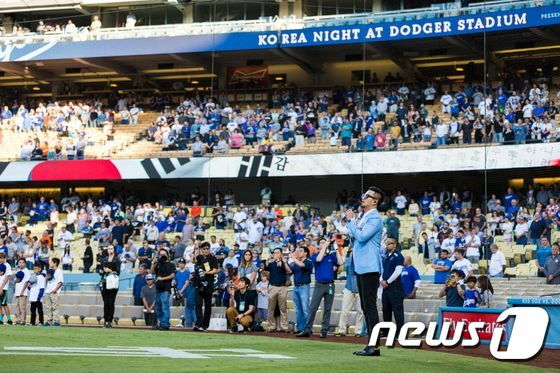 The team has famous Korean pitcher Ryu Hyun Jin on its roster and he was on hand for Korea night despite being still on the DL list. 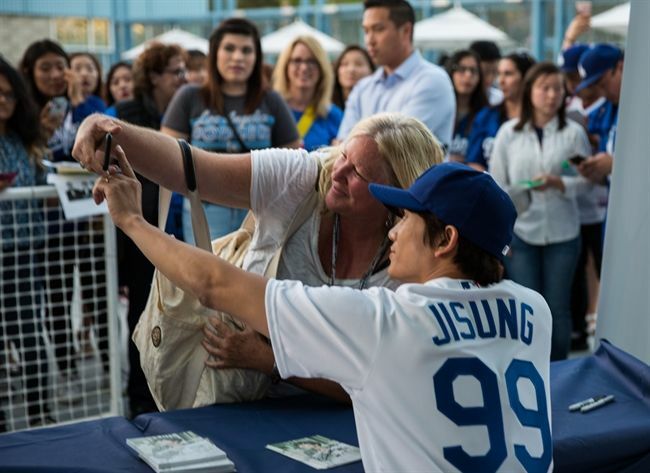 Ji Sung threw out the first pitch and afterwards manned a fan signing booth that hopefully brought in drama and movie fans who love the Dodgers and K-ent and therefore knew who Ji Sung is. 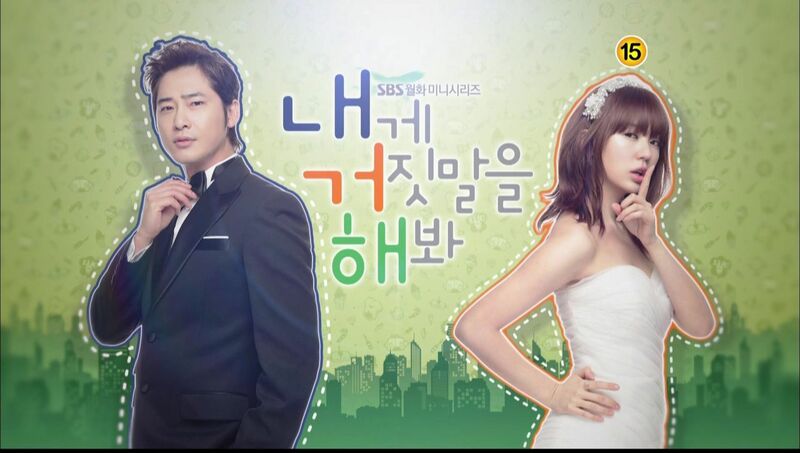 He also showed off his one year old daughter Kwak Ji Yoo born to him and wife Lee Bo Young last year. She’s soooooo adorable and even cuter is Ji Sung bringing her along to LA for the event and to the stadium to hang out. He’s probably being scouted to be on Superman Returns and it wouldn’t be a bad new addition to the show. His daughter is so cute. It’s sad that I’m neither in L.A nor a baseball fan. But if he was going to do Superman’s return, I’d definitely watch it. Aside from Haru and the Song Triplets, I am not a fan of other kids. 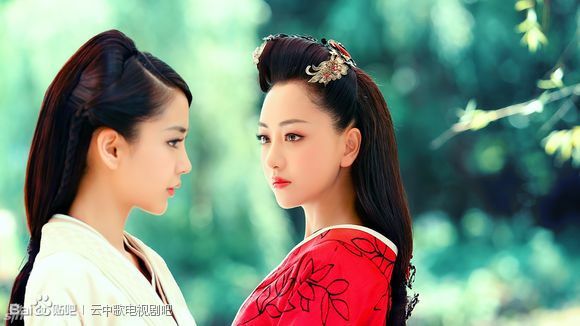 SR- it is so obvious that the show is trying to duplicate female triplets playing together with the 3 girls at present. They are cute but so young at present. Plus their dads really quiet it’s the captions who have to tell the stories. I don’t follow or read about SR but I really miss the triplets. The other children are not as interesting except for LHJ’s twins. JS and his daughter would be an excellent addition. Even I can’t work out what happened to Eugene’s baby. They just dissappeared one week. Eugene’s baby seems to now alternate every other episode with the 3 new baby girls who appear together with their dad squad. gosh that is one cute baby. Ji sung and his baby NEEDS to join superman returns. He has firmly stated in one of his interviews that he wouldn’t join Superman Returns as he doesn’t like his private life to be publicised. That’s so adorable. I love this showbiz couple. 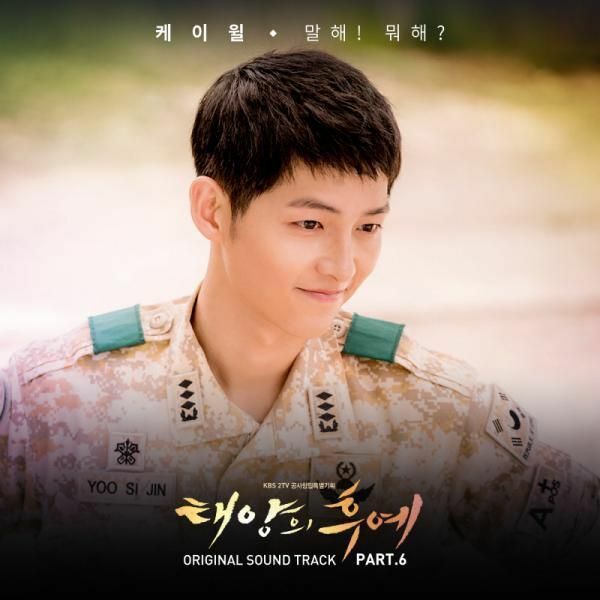 Both Ji Sung and Lee Bo Young are beautiful and great actors. Oh, so Kim Tae Woo also was there singing. 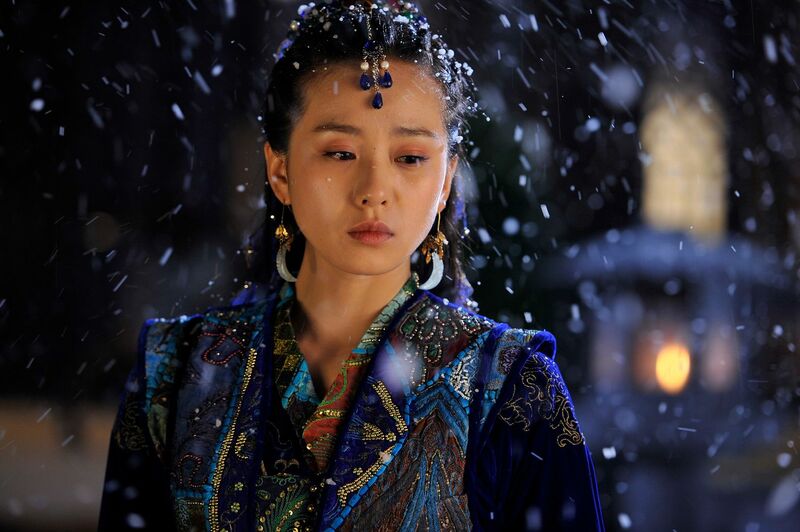 I hope that JS will not join TROS until maybe her child like 2-3 years old. I found it really nice and great we viewers got to share Lee dong gook’s family life on screen. Especially seeing Daebak as a few months old baby to now being 1plus years old. The growth he has shown being the youngest of 4sisters and him being so much more well behaved than LHJ’s twins.Sorry to say I always skip the twin boys parts. Dagnab it, MASN didn’t show the first pitch! Kim Hyun Soo has been doing quite well for the team after a rocky start. Nice to see him there in the photo gallery shaking hands with Ji Sung. 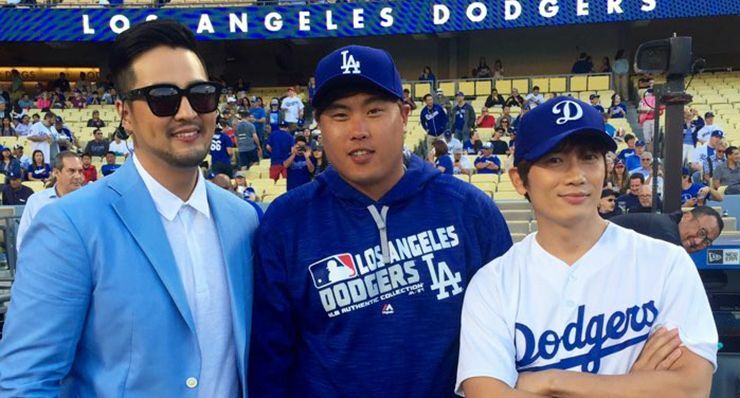 Ji Sung got his money’s worth on that trip, the game took 14 innings, and lasted about 5 and a half hours. 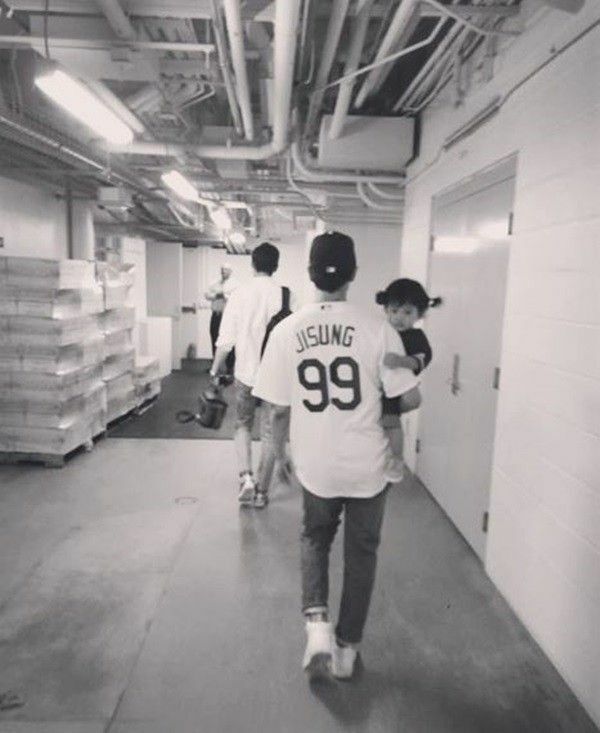 My ji Sung was in LA with his adorable baby. awww! 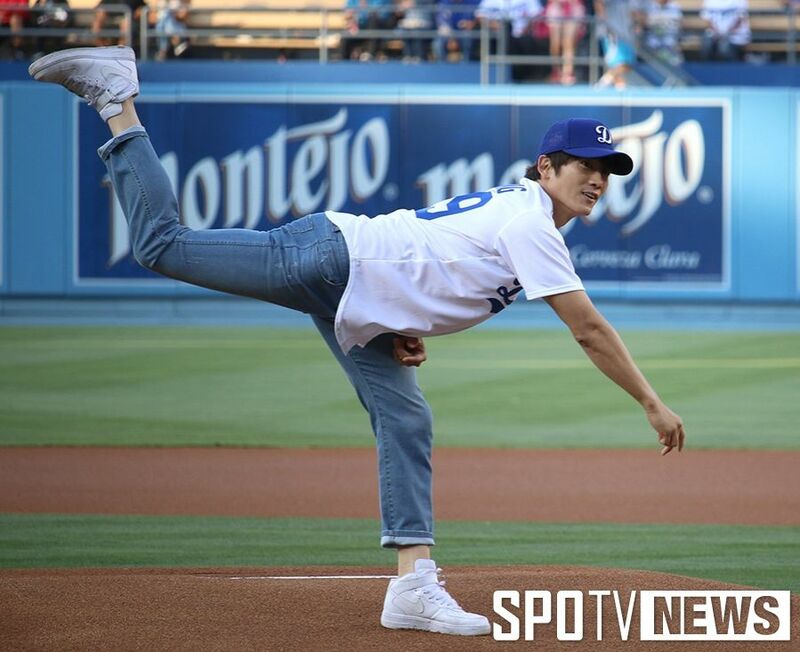 he seems mlike a daddy who would both teach his daughter pitching but would also play with dolls and have her tie ribbons in his hair.